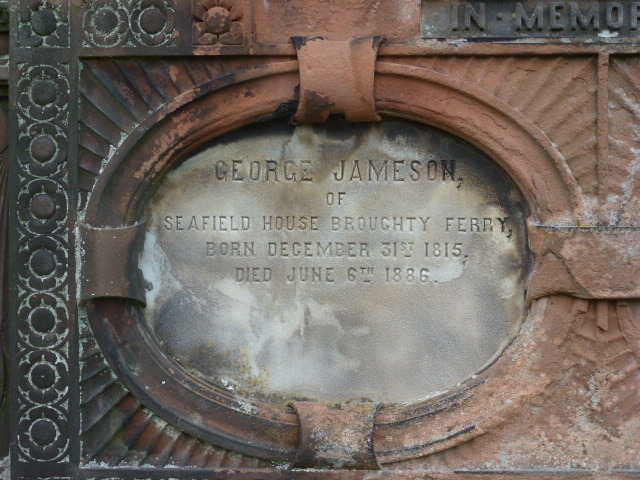 George Jameson, a London-born flax merchant, became the owner of a substantial fleet of vessels in Dundee. He also owned property in Broughty Ferry. He made a substantial subscription to the building of the Albert Institute. Established Church - Rev Dr Charles Adie (then of Greyfriar's, later of St Mary's East Church) officiated at George Jameson's marriage to Grace Brown Bell. 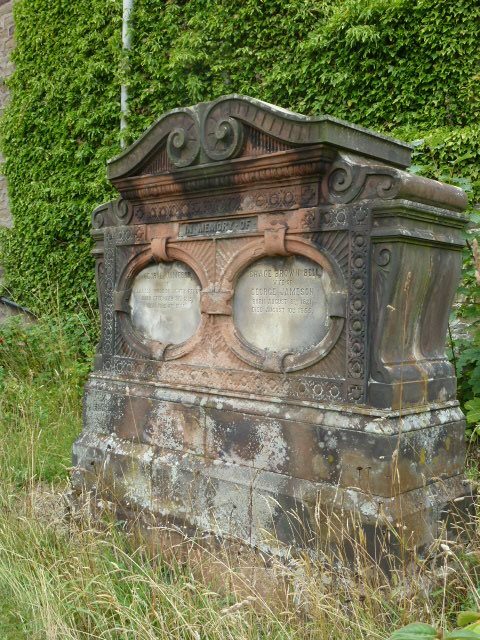 George Jameson's body was interred within the grounds of St Aidan's Church in Broughty Ferry. George Jameson was the son of William Jameson. William came from London to Angus and became Provost of Montrose at times in the 1820s and 1840s. Listed as a merchant at the beginning of the 1840s, George Jameson's business transactions must surely have been lucrative. By 1846, he had acquired the imposing mansion of Seafield House, (where he died in 1886) together with the substantial house of Ida Bank and other property.. In 1848 he acquired, in partnership with his father, his first ship, the barque 'Trident,' built in Montrose by Messrs J. & D. Birnie. He added the barque 'Stork,' also built in Montrose, in 1852; the brig 'Heron,' built in Dundee in 1856; the barque 'Gannet,' built in Dundee in 1857; the barque 'Crane,' built in Arbroath in 1857 and the schooner 'Osprey,' built in Arbroath in 1861. By 1864 he had a fleet of 6 vessels. Of these, the 'Crane' and 'Gannet,' both built in 1857, were designated to voyage to the West Indies, the 'Osprey,' 'Heron' and 'Stork' to the Baltic and the 'Trident' for the longer voyage to Archangel.. Both the 'Crane' and the 'Trident' were lost, along with many other vessels, to the ice in the White Sea in 1867. George Jameson was born in London to William Brown and his wife Maria Pritchard. George himself would only have been a boy when the family arrived in Montrose. 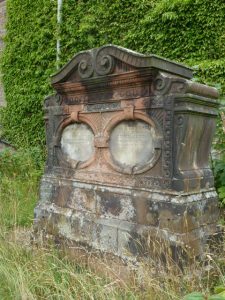 His father William became a linen merchant in Montrose and also served as Provost (during 1820s and 1840s) and Chief Magistrate of Montrose. By 1841, George Jameson, in his mid twenties and doubtless no stranger to the processes within the linen industry, was establishing himself as a merchant in Dundee. Shortly afterwards, in 1843, he married Grace Brown Bell, daughter of Thomas Bell of Belmont and sister of Thomas Bell Jnr., manufacturer. Fortunately, a telegram was received in Dundee from Captain Smith of the ‘Trident’ stating that he and his crew were at Archangel. They were all in good health and intended to leave for home in ten days. It was reported that his business connections had been principally with the lower Baltic ports where he had conducted extensive operations and had, for many years, partners or managers resident abroad to superintend his transactions in Russia. George Jameson’s obituary described him as having been ‘the last of the older generation of flax merchants, the most active part of his career having been spent contemporaneously with such men as William Small, William Collier, David Martin, David Pitcairn, W W Renny etc. who have all passed away before him.’ Four of these gentlemen also subscribed to the building of the Albert Institute. Having forged a successful career as a flax merchant over a number of decades, George Jameson, predeceased by his wife and son, led a retiring life in Broughty Ferry with his daughter Florence. His other daughter Mary survived him only by one year, leaving Florence as his only surviving child. Florence later married her cousin, Thomas Hope Bell (son of her uncle James Henderson Bell) in 1893, he having been 23 years her junior. Having become a woman of means through inheriting her father’s estate, (assessed at over £30,000) Seafield House, the family home for half a century, was sold in 1895. London Metropolitan Archives; London, England; Board of Guardian Records, 1834-1906/Church of England Parish Registers, 1754-1906; Reference Number: p71/mmg/012. Ancestry website. Old Parish Registers. Dundee. Marriages. (1843). 282/ 230 99. ScotlandsPeople website. Census Record. Monifieth. (1851). 310/ 3/ 6. ScotlandsPeople website. Dundee Directory, 1845, p.44, Local Studies section, Central Library, Dundee. Dundee Directory, 1846, p.122 et seq. Local Studies section, Central Library, Dundee. Scotland's Places/Records/Ordnance Survey Name Books/Forfarshire (Angus) OS Name Books 1857-61/Forfar (Angus) volume 70/OS1/14/70/57. ScotlandsPlaces website. Seafield House plans, 1948. Box 1 no.58 and box 3 no.153. Dundee City Archives. Cronshaw, Andrew. (1998) Broughty Ferry. Stroud: Nonsuch Publishing. p69. Seafield House School and photo. Local Studies section, Central Library, Dundee. Statutory Records. Monifieth. Deaths. (1886). 310/ 81. ScotlandsPeople website. Obituary, Dundee Advertiser, 8 June 1886, p10(1). British Newspaper Archive website. Obituary, Dundee Courier, 7 June 1886, p2(7). British Newspaper Archive website. Obituary, Montrose Arbroath and Brechin Review, 11 June 1886, p3 (6). British Newspaper Archive website. Funeral, Dundee Courier, 12 June 1886, p2 (7). British Newspaper Archive website. Dundee Courier, 16 August 1864, p1(1). British Newspaper Archive website. Dundee Directory, 1861-62. p.14. Local Studies section, Central Library, Dundee. Dundee Directory, 1840, p.29 & Dundee Directory, 1842, p.40. Local Studies section, Central Library, Dundee. Dundee Directory, 1845, p.44 & Dundee Directory, 1846, p.122. Local Studies section, Central Library, Dundee. Dundee Directory, 1850, p.114; Dundee Directory, 1856, p.104; Dundee Directory, 1858, p.143. Local Studies section, Central Library, Dundee. Dundee Directory, 1861, p158 et seq. Local Studies section, Central Library, Dundee. Scottish Post Office Directories. Angus & Mearns. Montrose. 1846-47. p.44. National Library of Scotland website. Valuation Roll, Forfarshire, Monifieth, 1884. Local Studies section, Central Library, Dundee. Dundee Courier, 17 May 1848, p3 (4). British Newspaper Archive website. Dundee Shipbuilding. 1856-70. class no D31092. Local Studies section, Central Library, Dundee. Lloyds Register of Shipping. 1864-65. http://books.google.com/books?id=PQHEJh5yj2YC&amp;oe=UTF-8. Dundee Courier, 29 June 1867. p.2.(6]. British Newspaper Archive website. Dundee Courier, 10 July 1867. p3.(2). British Newspaper Archive website. Legal Records. Wills and Testaments. Dundee Sheriff Court. (1886). SC45/ 31/ 37. ScotlandsPeople website. Legal Records. Wills and Testaments. Forfar Sheriff Court. (1870). SC47/ 40/ 37. ScotlandsPeople website. Warden, Alexander J. The Linen Trade, Ancient and Modern. (1864). London. Longman. Dundee Courier, 17 May 1848. p.3. Findmypast website. Southern Reporter, 18 July 1867. p.4. Findmypast website. Dundee Courier, 23 December 1868. p.1. Findmypast website. Dundee Courier, 20 August 1869. p.1. Findmypast website. Dundee Advertiser, 8 June 1886. p.10. Findmypast website. Dundee Courier, 25 July 1893. Findmypast website. Dundee Courier, 12 July 1895. Findmypast website. The information above about George Jameson has been collated from a range of digital and hard copy sources. To the best of our knowledge it is correct but if you are relying on any information from our website for the purpose of your own research we would advise you to follow up the sources to your own satisfaction. If you are aware of an inaccuracy in our text please do not hesitate to notify us through our Contact page.